I have developed a company that has the ability to encapsulate coffee into capsules to compete with Nespresso coffee capsules. Unlike Nespresso we will not have the capacity or demand to produce 12 billion per year. We will be much more targeted to the local New Zealand Market. Our brand will be positioned around the following: Fresh NZ coffee for the NZ taste palate. NZ Blends, NZ roasted, NZ Ground, NZ Encapsulated. We will be a web based sales business so I need a strong brand and logo. This artwork/branding will go on the packaging as well as the website and business cards etc. 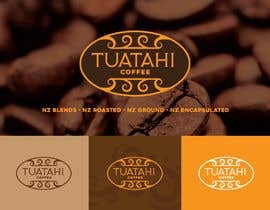 The Brand name will be Tuatahi Coffee. So I need a coffee or coffee capsule inspired design/font with a logo to match. FYI after seeing some initial designs I am very quickly taking a liking to the designs that incorporate some sort of tie to the actual capsule. I made my entry second but I was tagged copycat. How could this happen?? I want to express my gratitude to all who contributed. I am amazed at the creativity shown along with the quality of work. It is truly appreciated. However I now have the task of choosing a winner. Please bear with me as I had no idea that there would be so many submissions. Freelancer predicted that I would have 80 submissions but I have received 1166. So it will take me a few days to narrow it down and gain feedback from others involved. Thanks. Sir can you please share your mail id as I missed to upload my entry. I, ii show you how to do my new job? Are there possibilities to send another design proposal? As I am reviewing these designs please let me know if something is a copy. Just post the link and I will review. I am not wanting any lawsuits for copyright. Thanks. I don't yous mockup . I want client take original design. Sir . I request please take only without mockup logo cz Bad design use in to look like very good before this logo you don't like . I am sure . Please be aware that I am now starting to rank all designs purely so I can show my initial thought to others involved. They will then review and make their adjustments. So just because I rate a design as a 2 doesn't not mean it is out of the running. Cheers. Also I was planning of giving feedback on all designs however that idea rapidly declined as the numbers of submissions grew. So apologies if I do not give you the feedback you desire. I will attempt to respond to all those that do would like feedback but i can't promise I will get to them all. Although the vast majority of designs are good here is a list of the main reasons I am declining them: 1. too similar to well know brands i.e. Starbucks. 2. Brand not bold enough or clear enough. 3. wrong sort of capsule (a coffee capsule looks nothing like a medicine capsule). 4. Design too difficult to laser etch onto a foil lid. 5. Just doesn't seem to be quite the right fit the brand look/feel we are going for. please check #545 #583. I am sure you will love it. Please sir check the entry #1100 & #1103. Thank you. Please check #1062 .. Icon is a 3D model..i could modify it as you want.. thank you. Sir, please check my simple logo #1007, #1008, #1009, #1010, Thank you.